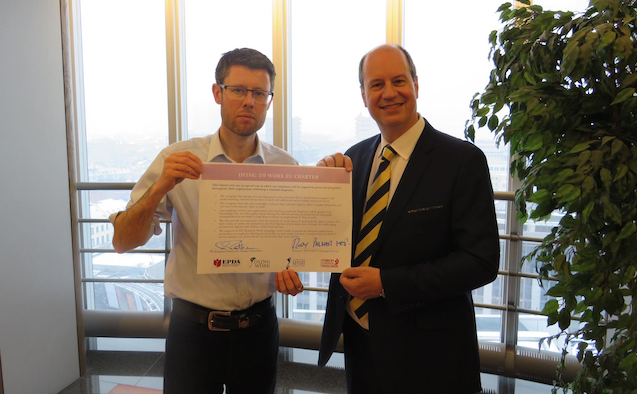 The European Parkinson’s Disease Association (EPDA) has signed the Dying to Work Charter – a pledge protecting the workplace rights of people with serious conditions. The charter – part of the Trade Union Congress’ wider Dying to Work campaign – has so far protected over half a million workers in the UK. The Dying to Work campaign group, chaired by MEP Rory Palmer, is calling on the European Union to amend its current legislation. The campaign is asking for serious conditions to be identified as a ‘protected characteristic’ – meaning employees would enjoy a protected period after diagnosis which would ensure the couldn’t be unfairly dismissed. Image: Rory Palmer MEP (left) and Russell Patten, secretary general at the EPDA (right). To support the charter, please click here. For more information on working with Parkinson’s please visit the EPDA website. Could robots replace animals in Parkinson’s medical trials?